Medieval walled cities of Veneto, Italy. 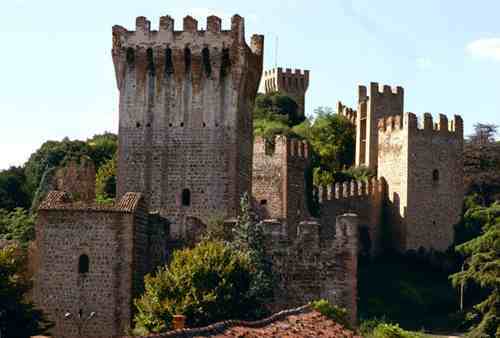 Este is one of the medieval walled cities you should not miss during your holiday in Veneto, Italy. It lies at the foot of the scenic Colli Euganei (Euganean hills), about 40 minutes by car south of Padua. The name Este comes from the river Adige – Athesis in Latin – that flowed across the town’s territory until 589 AC, when a series of earthquakes combined with tremendous floods moved its course a few kilometres to the south. The town of Este boasts a very remote origin: it was founded by the ancient Venetos that later allied with the Romans against the Gauls. After the fall of the Roman Empire Este suffered continuos attacks from Barbarians people and lost its importance. Little by little, after the tough period of the early Middle Ages, the town rose again with the noble family Este - whose name comes just from this Veneto’s town - one of the most important Italian dynasties, gone down in history for being big patrons, lovers of arts and men of letters. After the Este family moved to the town of Ferrara, where they established the renowned Estensi court, Este was conquered twice by Ezzelino da Romano, and then disputed by the Carraresi, the Scaligeri and the Visconti. Like many medieval walled cities – for example the nearby Montagnana– Este is surrounded by an imposing circle of walls scenically clambering up the top of the overlooking hill. The well preserved circle of walls is 1Km/0,62mi long and spaced by 12 towers, crowned by a square keep at the top of the hill. The area within the walls has been turned into a scenic public garden, a haven of peace and greenery where to stroll around and relax. Within the walls, located at the bottom of the park, lies a Palace built in the late 1500s by the noble Venetian family Mocenigo: today it hosts in its interior a Museum established in 1887, i.e. the Museo Nazionale Atestino (visit 9am-7pm, closed on Monday). It is one of the most important museums of Italy in terms of archaeological finds dating back to the pre-Roman times. Noteworthy are the necropolis archaeological finds, like vases – have a look at the Situla Benvenuti, a bronze vase dating back to the 7th century before Christ - then at weapons, razors, tombstones, small statues, etc. In the museum there is also a section dedicated to the Roman period of Este and surroundings. Furthermore, there is also a section dedicated to the traditional ceramic production of Este, displaying items created and painted in a period ranging from the 13th until the 18th century. The main square, Piazza Maggiore, was the core of the town during the Renaissance, and so it is today, lined with stores and bars with outdoor tables. At the south side of the square, take a look at the Palazzetto degli Scaligeri, a 1300s gothic palace hosting a library with about 50,000 volumes. Take a look also at the Romanesque Chiesa di San Martino, the oldest church of Este, built in 1026. Continue on towards the shopping road Corso Matteotti and its elegant arcades, finally reaching the symbol of Este: the clock tower, called Porta Vecchia (old gate). Continue your walk towards via d’Azeglio along the fortifications up to Contrada San Francesco with its 1500s gate and the old convent. Don’t forget the imposing Cathedral of Santa Tecla, erected over the ruins of an early Christian Church: in its interior lies a painting of Gianbattista Tiepolo, considered a masterpiece. From the Cathedral starts a pleasant walk called Sentiero del Principe – Prince’s trail – winding among elegant 1500s-1700s villas and gardens. At the end of the trail, not far from the castle keep, you’ll reach the famous 1800s Villa De Kunkler, which played host to the poets George Byron and Percy Shelley in 1818. Continue forward up to the late 1500s Palazzo del Principe, designed by Vincenzo Scamozzi. The building is called Prince’s Palace as in 1676 Alvise Contarini was elected Doge of Venice while living there. In Este, like in other medieval walled cities located near the Euganean hills, you can buy local olive oil and wine. But most of all Este is celebre for its ceramics production, a very long tradition that started since the prehistoric times. Thanks to the unique earth of the area, and to the presence of great artists, the Este’s ceramics have always been rated highly and continue to excel in this day and age. Autostrada (Highway) A4 Milano-Venezia, exit in Soave, follows signs to Cologna Veneta, Montagnana and Este. Autostrada A13 Padova-Bologna, exit in Monselice, then follow signs to Este. Get to Monselice by train. From Monselice there is a regular bus service to Este.